Last spring Ruth Hardinger proposed an exhibition that she and Babs Reingold conceived of several years ago entitled Planet Ax4+1. Quoting from their initial proposal, “Four disparate artists, distinct in their mediums and yet, banded by an analogous cause, have come together to propose an exhibit on Climate Change and how it impinges four positions of the Earth. Multiple definitions exist for our primary title, Tipping Point. Common denominators are shifting “out of balance” or are past the balance. Consequences of this effect swiftly proliferate, influencing crime, epidemics … and have of course, most significantly, our planet.” The artists in the original proposal were Ruth Hardinger, Babs Reingold, Christy Rupp, and Rebecca Smith. Certainly the concept and call to arms grows more urgent by the day, and could have included many other artists working with eco–awareness and the environment such as Mark Dion and Pam Longobardi to name of few, so we have added a fifth participant to this Gang Of Four, the equally relevant and powerful voice of Kelin Perry. Ruth Hardinger’s socially conscious artwork, signified by abstraction and influenced by environmental issues, is expressed in her sculptures, installations, paintings, works-on-paper, pigment prints, and photographs. Her work has been shown in many solo and group exhibitions. A selective list of venues in which her works have appeared in solo and duo shows includes: Amalie A. Wallace Gallery, Old Westbury, NY, Trace/Matter, Five Myles, Brooklyn, NY, Long Island University Brooklyn, NY, CREON, Sideshow, Lesley Heller Gallery, Artists’ Space, Catskill Art Society, Brunnier Gallery, Iowa State University, and Museo: Centro Cultural de Santo Domingo (Oaxaca, Mexico), Brian Morris Gallery, and most recently, DAVID&SCHWEITZER Contemporary with a one person booth at VOLTA NY. Hardinger was a co-curator, panelist, and participating artist in EMISSIONS: Images from the Mixing Layer at Cooper Union, supported by grants from The Robert Rauschenberg Foundation and The Marfa Dialogues. She received First Prize at Hudson River Museum, and showed Museo Nacional Centro de Arte Reina Sophia, Madrid. Year long grants: Institute for International Education, sponsored by Fulbright Foundation, US-Mexico Commission, McDowell Traveling Scholarship to Europe from Art Student’s League. 3 Month Grant: Altos de Chavon, Dominican Republic. Perry’s practice extends outside of the studio and utilizes her skills as a sculptor and professional architect. It is to an extent per formative, much in the same way Richard Long, Wolfgang Laib, and Andrew Goldsworthy will go for long walks in nature and create sculpture from the natural materials they gather in these meditative walks. Perry scavenges along railroad tracks and in abandoned buildings for discarded and decayed materials. Using these, she creates sculptures of fish and animals – living fossils that reclaim the dignity of these often exploited and disrespected creatures. Her work will be the subject of an upcoming one-person exhibition in Atlanta, Georgia in 2018 and she has participated in numerous group exhibitions in the South over the last decade. Reingold is best known as a visual and conceptual artist for creating alternate ambiguities with her wall art and installations as they relate to the environment, poverty, and beauty. 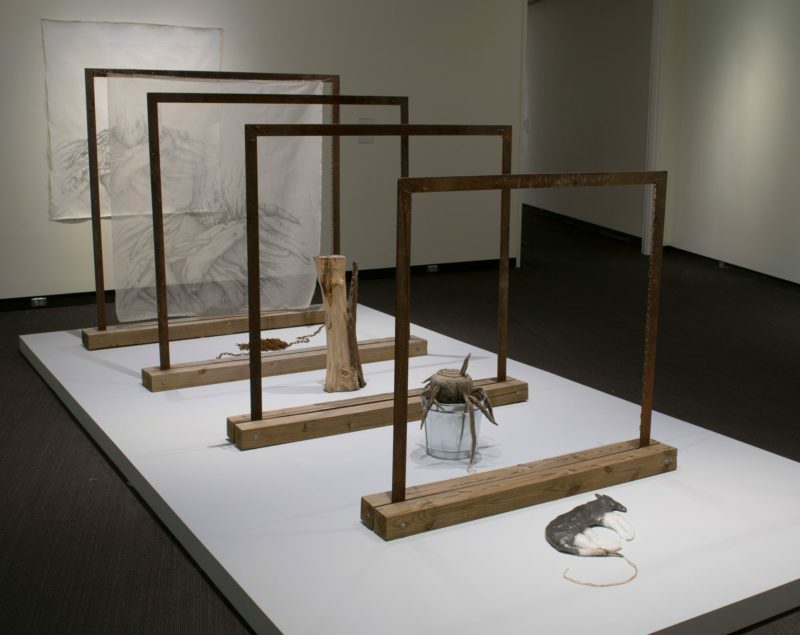 She draws on her early experiences of hardship to create elaborate installations using domestic objects and natural materials like clotheslines, threads, human hair, animal skins, organza fabric structures, rust and tea staining, and encaustic. The dynamics of the environment, power, technology, and the manipulation and destruction of nature are recurring themes in her art. Her installation The Last Tree portrays the world’s 193 countries with fabricated silk organza tree stumps stuffed with human hair in pails. This elaborate installation, curated by Midori Yoshimoto at the ISE Cultural Foundation in New York, illuminates Jared Diamond‘s question What was the Easter Islander thinking when he chopped down the last tree? resulting in a culture that demolished the entire wealth of its natural resources. A second show of the traveling exhibit was at the Burchfield Penney Art Center in Buffalo, New York in 2016-2017. Recent museum showings were at the Museum of Fine Arts (St. Petersburg, Florida) in 2015-2016. Reingold’s works of art can be found in numerous public and private collections around the world, and are included in the permanent collections of the Newark Museum of Art in Newark, New Jersey; the Museum of Fine Arts (St. Petersburg, Florida) in St. Petersburg, Florida; and the Savannah College of Art and Design in Savannah, Georgia, among others. Rupp Is an American artist and activist. She lives and works in New York City and the Hudson Valley in New York. Her work is inspired by the study of animal behavior. She is one of a group of early eco-artists concerned with urban ecology and our perceptions of nature. Her work has been shown extensively at galleries and museums. As a resident of lower Manhattan in the late 1970s she exhibited in early artist run spaces including Exit Art, 3 Mercer Street Store, (a precursor to Fashion Moda, Franklin Furnace, the Kitchen, Artists Space, The Clocktower and PS1 International Studio Program, and ABC No Rio. Artists illegally occupied an abandoned city owned building for the groundbreaking Real Estate Show. She participated in the explosion of late 1970’s artist generated activity which included Collaborative Projects, Group Material, Artists Call Against US Intervention in Central America (a nationwide mobilization of writers, artists, activists, artists organizations, and solidarity groups that began in New York in 1983), P.A.D.D. (Political Artists Documentation and Distribution), Artmakers, Ventana (a collective of artists in Support of the Artists threatened by US aggression in the Contra wars of the 80’s in Central America). Her work appeared in early publications of The Soho News, East Village Eye, Heresies: A Feminist Publication on Art and Politics, World War 3 Illustrated, and Bomb Magazine. The first publicly visible work was “The Rat Patrol,” which was an outdoor poster project of a life-size rat pasted where garbage accumulated, pointing out the fact the city is a living ecosystem with a delicate balance. “Surely a photograph of a rat borrowed from the NYC Health Department files and mechanically reproduced is not a creation of artistic imagination…it would be unthinkable to see the picture on exhibition in a museum.” – Douglas Crimp. She is the recipient of Creating a Living Legacy, Joan Mitchell Foundation (2015), Anonymous Was A Woman Foundation (2010), National Endowment for the Arts Fellowships (1984, 1986), New York Foundation for the Arts (1986), Art Matters Inc (1986, 1988). Rebecca Smith attended Sarah Lawrence College and The New York Studio School. First exhibiting in 1977, she has been making art since the late 1970s, in various media including painting, performance, sculpture and tape drawing installations. Her work is in the collections of the Brooklyn Museum, Microsoft, The Tarra-Warra Museum of Art, Australia, The Albright-Knox, and The Hyde Collection, among others. Smith recently had the distinction of being a co-curator, panelist, and participating artist in EMISSIONS: Images from the Mixing Layer, as part of The Marfa Dialogues on Climate Change at Cooper Union. She exhibited a large sculpture, Noctilucent Clouds (2015), in Here and Above: A Dialogue Between Sculptures at the Virginia Museum of Fine Arts, Richmond, which has been acquired by the museum and remains on view, 25 feet high on the atrium wall. Her most recent one-person exhibition was at Hionas Gallery in NYC in 2016 and is currently exhibiting at the Maier Museum of Art in Lynchburg Virginia in Atmospheric Conditions: Gathered and Unsettled.